Confession: I’m a Tolkien fan, and I have enjoyed each of Peter Jackson’s movies based on The Lord of the Rings and The Hobbit — yes, even last years’s The Hobbit: An Unexpected Journey, whose flaws were, in many respects, owing to Jackson’s fascination with the entirety of Tolkien’s oeuvre. That being said, The Desolation of Smaug is a far superior film. It’s a nearly three-hour romp through Middle Earth, which, ironically, only runs out of steam when Bilbo encounters the dragon deep in the heart of the Lonely Mountain. Yes, Smaug is magnificent, but, really, how long do we have to watch him blast through walls of Erebor and breathe tunnels of flame at defenseless dwarves? The literature on Tolkien and theology is expansive and seemingly growing. I have not studied it in earnest, but I suspect that one issue that crops up is Tolkien’s understanding of evil. Is evil, for him, something that is, or is it a privation of being? The latter view, as is well-known, was common for many of Christianity’s greatest thinkers (Augustine, Aquinas, et al. ), who, while not denying that evil things happen in the world, asserted that such things are neither created by God nor part of the structure of being itself. The upshot, for them, was the very nature of the cosmos: is it a place where good and evil are locked in a perpetual war, or is it a place where good always already retains primacy and will, indeed, prevail in the end? They are grisly, to be sure. And yet, they are clearly distortions of the human form; they are not a race sui generis but, rather, a deficient version of that which is. That, in fact, is why they are so frightening, for they represent the privation of the good, the true, and the beautiful. Of course, in this, Jackson again follows Tolkien, who wrote that the orcs were bred from elves captured and subsequently corrupted by Melkor, one of the Ainur (angelic spirits), and himself a fallen being. 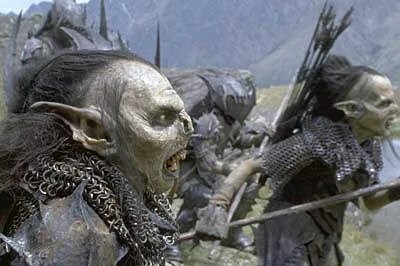 In Middle Earth, whether in page or on screen, evil does not have the first — or the last! — word.